Pneumonia is the name we give to lung infection. 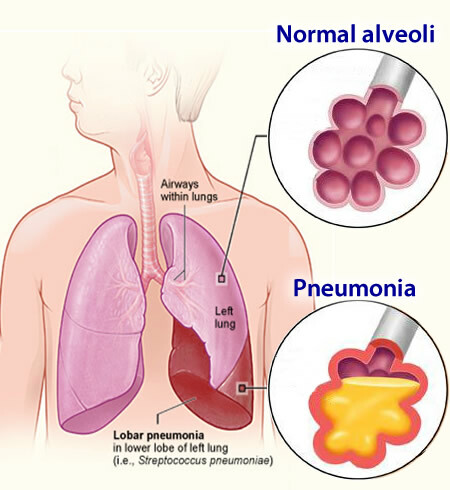 To be more precise, pneumonia is an infection of the lung tissues and their alveoli. To understand what pneumonia is it is first necessary to learn the anatomy of the lungs a little. Read the text and follow the illustration below to understand the explanations better. The air we breathe enters through the nose and / or mouth and goes into the trachea. The trachea upon reaching the level of the lungs, bifurcates, forming the main bronchi, one for the left side and one for the right and these bronchi also bifurcate to form the bronchioles, which eventually end up in the alveoli. Each time there is a bifurcation, the structures will become progressively smaller. The alveoli, which are the end point of the respiratory tree, are microscopic cavities that are in contact with the bloodstream. Through these cavities exchanges of respired gases (oxygen and carbon dioxide) are made. Inhaled oxygen enters the lungs and reaches the alveoli. Oxygen passes quickly through the air-blood barrier into the blood in the capillaries. Carbon dioxide passes from the blood into the alveoli and so, as we all know, we inhale oxygen and exhale carbon dioxide. In pneumonia, the alveoli are filled with purulent secretions, preventing the entry and exit of gases. In these affected by the infection wells there is no exchange of oxygen for carbon dioxide. The more wells affected by pneumonia, the more severe is the condition. The patient may present with extensive pneumonia respiratory failure, needing to be intubated and connected to a respirator to get keep the blood properly oxygenated. Pneumonia can be caused in descending order of frequency, of bacteria, viruses, fungi and parasites. 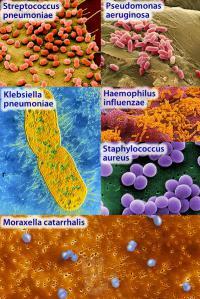 None of these germs that cause pneumonia are contagious. In most cases pneumonia is of bacterial origin. The bacteria that most commonly cause pneumonia are Streptococcus pneumoniae, Pseudomonas aeruginosa, Klebsiella pneumoniae, Haemophilus influenzae, Moraxella catarrhalis and Staphylococcus aureus. Indeed, "catching pneumonia" is not an accurate term, since this is the idea of disease transmission among individuals. Pneumonia is not a contagious disease like the flu or tuberculosis. You can get in contact with a patient with pneumonia without risk of contamination. How then does pneumonia arise? Our lungs are organs constantly exposed to microbes from the air and our own bacterial flora of the mouth. We do not get sick all the time because the lungs have their own defense mechanisms that keep germ free. Among these systems we mention the cough reflex, the presence of immune cells throughout the respiratory tract and the existence of microscopic cilia in the bronchial tree which "sweep" invading agents out of the airways. The development of pneumonia depends on the virulence of the invader, the amount of microbes that can reach the lungs and immunological conditions of the patient. In general, pneumonia arises when a germ aggressively penetrates the respiratory tract and the defense system is compromised. Trivial situations can reduce the defenses of the respiratory system. For example, patients who smoke have a constant irritation of the entire bronchial tree protectors and dysfunction of cilia. 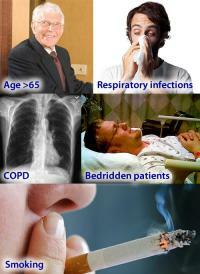 Lung defense cells are also affected by smoking and do not work so well. All these favors the appearance of respiratory infections. 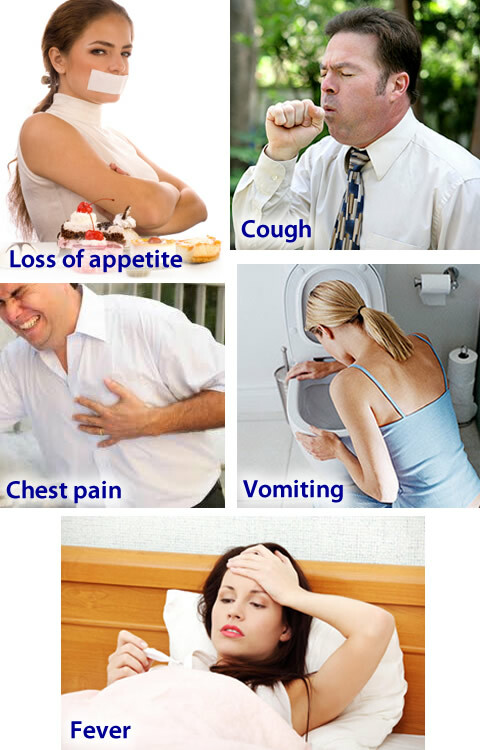 Another example is patients with influenza. The injury that the flu virus causes respiratory system also favors the invasion of bacteria, which take advantage of the reduction of patient's ability to fight germs that reach the innermost parts of the respiratory system. Older people naturally have a weaker immune system, which puts them at greater risk of developing pneumonia. Similarly, people already weakened by other diseases, such as heart failure, alcoholism or diabetes also have higher risks. A very serious type of pneumonia is aspiration pneumonia. It occurs in people who vomit and aspire after their contents. It is a kind of pneumonia in patients with common level of consciousness, which lose the ability to cough or to swallow their own saliva, causing the secretions from the oral cavity fall into airways. The airway that person is exposed to has a huge amount of microbes, much higher than in normal condition, favoring the development of pneumonia. A common example is someone who drank a lot and is in an alcoholic coma or pre-coma. The signs and symptoms of pneumonia include cough, fever, chills, shortness of breath, chest pain when deep breath, vomiting, loss of appetite, malaise and body aches. There may be presence of blood mixed with sputum. The fever is usually high. 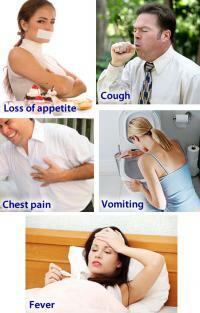 It is very common for pneumonia to arise as a complication of influenza. Often the patient attributes their symptoms of pneumonia to influenza, slow to seek medical help. It takes attention to cases of influenza that do not improve or even worsen progressively, especially if the patient is elderly. Patients over 60 or with other diseases such as renal failure, heart failure, cirrhosis, HIV or immunosuppressive drugs, may present a more discrete pneumonia, with little cough and no fever. Sometimes pneumonia in this group is only present with prostration and mental changes such as confusion and disorientation. One of the possible complications of pneumonia is the formation of pleural effusion, which contributes to the onset of fatigue and shortness of breath. In extensive pneumonias, when much of the lung tissue is affected, the patient may go into respiratory failure, necessitating intubation, mechanical ventilation and hospitalization in intensive care unit (ICU). There is a group of bacteria including Mycoplasma, Legionella and Chlamydia, which cause the so-called atypical pneumonia. They are forms that may have slower development framework and pneumonia is not so obvious in this case. Many patients presenting with symptoms of cough and sputum are frightened by the possibility of having tuberculosis. The difference is in the time of disease progression. Pneumonia is an acute condition that occurs in hours. The patient becomes ill with the disease shortly, seeking medical attention within the first 72 hours of illness. Tuberculosis presents itself as a more drawn out, with symptoms gradually worsened and the patient often seeks medical attention only several weeks after the onset of symptoms. 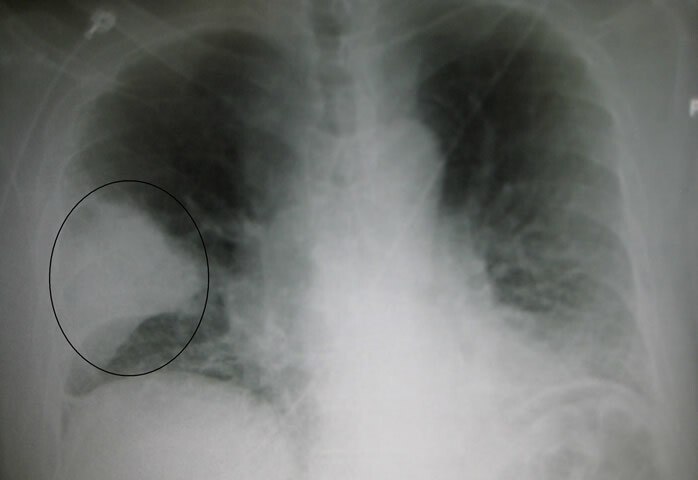 The diagnosis of pneumonia is usually done with physical examination and a chest radiograph. Blood tests can help but are not essential. A good doctor is able to diagnose pneumonia only with the clinical history and physical examination. Radiography, as it is a cheap and widely available, is usually required to confirm the diagnosis. The alveoli filled with secretion appear as a white spot on chest radiography, as you can see in the picture. The blood of a patient with pneumonia shows a great increase in the number of leukocytes, typical of bacterial infections. In severe cases patients who require hospitalization, usually try to identify, which bacterium is responsible for pneumonia. 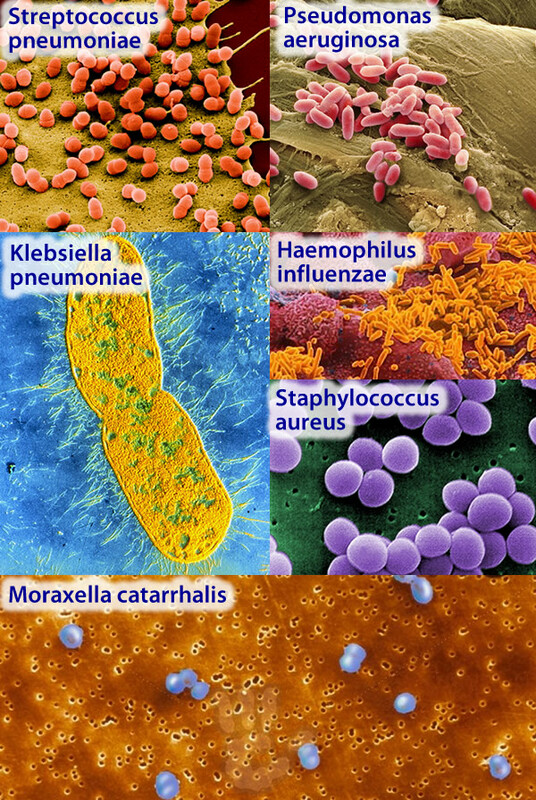 We can find the bacteria in blood (by blood culture) or in the patient's sputum. In selected cases it may be necessary to collect secretions from the lung directly through bronchoscopy. Pneumonias are divided into community, when acquired on the day-to-day activities, and when they arise in hospitalized patients. Pneumonia is more serious and more difficult to treat because it is usually caused by bacteria more resistant and affects more vulnerable patients. 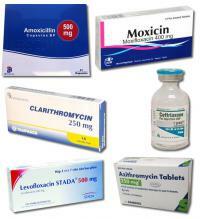 The treatment of bacterial pneumonia is done with antibiotics for at least eight days. The community-acquired pneumonia can be treated with oral antibiotics, but those that evolve badly require hospitalization and intravenous antibiotics. 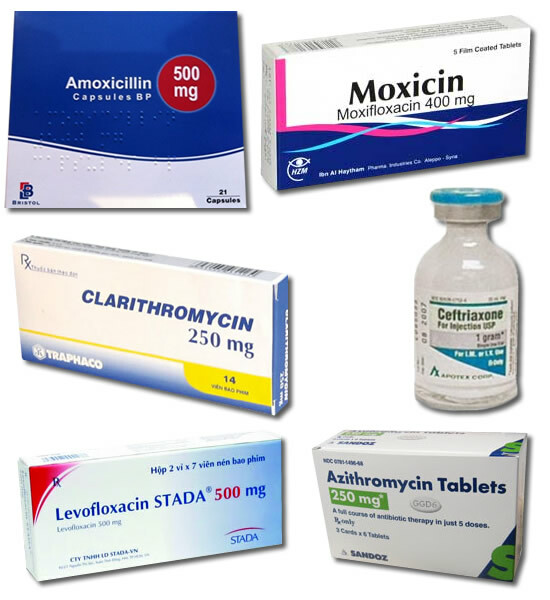 The main drugs used for community-acquired pneumonia are amoxicillin, azithromycin, clarithromycin, ceftriaxone, levofloxacin and moxifloxacin. Signs of improvement are expected from the third day of treatment. Pneumonia can easily lead to sepsis and tend to be important cause of death in the elderly and immunosuppressed patients. There is a vaccine against streptococcal pneumonia, caused by Streptococcus pneumoniae, the most common type. It is recommended for children and people over 50, but does not prevent pneumonia caused by other germs. Does catching cold cause pneumonia? The story of cold is widespread in the population, but has only a small portion of truth. As I have explained, to have pneumonia you need a bacterial infection, not just a stream of cold air to infect us. What happens is that when it is cold our defense system, mainly the cilia in the airways, work slower, favoring the invasion of germs. In winter people walk on the street and less tend to cluster indoors, favoring the transmission of viruses such as influenza. As has been mentioned above, viral respiratory infections are risk factors, especially in the elderly, for the appearance of pneumonia. So, nobody "catches pneumonia" because they open the refrigerator with wet body or because they take a shower just before leaving work or school. Fortunately, our immune system is strong enough to deal with trivial situations like these.